If you're going to cheat, might as well use an official cheat sheet! 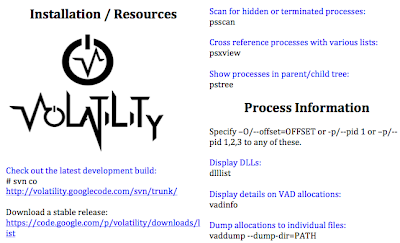 Need some help navigating through all of Volatility's plugins and options? Want a birds-eye view of the framework's major capabilities for Windows operating systems? Not sure where to look or who to ask for more information on the project? This cheat sheet should solve all three of your problems, and then some. Click on the image to the right to open the PDF cheat sheet. Teaser: Registration for our next Windows Malware and Memory Forensics Training Course opens next week (Monday March 18th, 2013). Stay tuned for the announcement and details.